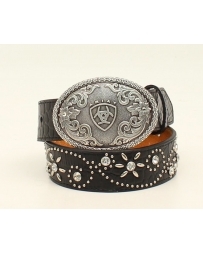 Trendy girls Ariat belt by M&F Western Products®. This belt features a flower and scroll pattern made out of nail heads and rhinestones. Topped off with an oval Ariat buckle. Available in sizes 18-28.